Posted by elizabethwong in Democracy, Malaysia, Note2Self, Politics. I had to hear this from my hairstylist. Posted by elizabethwong in Democracy, Malaysia, Politics. Nope. This doesn’t refer to 143 impossibly buffed and gorgeous guys in Ijok, though I have to admit KeADILan does have a disproportionate number of distractingly good-looking men :P.
There are 143 unreturned ballot papers from the Ijok by-election. One would may think this is quite trivial. But from a local MCA source, their disappearances point to a tactic used manipulate the votes. Najib will get sued – not once, but twice. The first was about the distortion of events which led to the ‘Dawn Raid’ of the London Stock Exchange in 1981. Najib is not being sued for distorting the facts, but for calling Tan Sri Khalid Ibrahim a ‘liar’. Not surprisingly no one reported about TS Khalid’s rebuttal. I am at a complete loss for words when I was alerted of a news flash on Bernama by a journalist. I don’t think it gets any dirtier filthier than this. Doctoring speeches. Cutting out a word to subvert an entire sentence. Making up things that never happened. At least the Editor-in-Chief doesn’t hide about which side his bread’s buttered, and who butters it. Barisan has taken a gamble, as a matter of principle, by deciding on an Indian candidate although the constituency has only 28% Indians and the opposition candidate is Tan Sri Khalid Ibrahim, a Malay. If voting is based on race instead of a candidate’s policies and credentials, then it would be a sad day for Malaysia. Is this the only way BN knows how to deal with the rakyat? 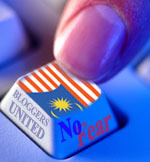 As the days approach closer to polling day on 28th April, it’s now becoming a case of BN flexing its muscles. For all the public funds that it’s literally throwing to the residents of Ijok, the entire state machinery – government, police, Election Commission, even welfare bodies and universities, BN has shown that it is nothing but cheap and woefully lacking in imagination, ideas and vision. Posted by elizabethwong in Democracy, Economy, Malaysia, Politics. This RM36 million allocation is damn insulting to the people of Ijok. After years of being left out from ‘development’ and considering Selangor is the nation’s FIRST ‘developed’ state, the good folks of Ijok deserve so much more. Let’s take this sum of RM36 million as a base figure. Multiply by how many ‘Malaysian Plans’ we have (9) = RM 324 million. Leading the pack is the darling of women’s groups here, Dr. Rozaidah Talib who made 11 trips costing RM141,391.66 to attend the Commonwealth Parliamentary Association (CPA) meetings in her capacity as the South East Asia representative of the Commonwealth Women Parliamentary. And her travels were already partially subsidised by CPA. Toady-ing hits new heights today. This is so mind-numbingly stupid that I’m speechless. Perhaps these are the real tasks of the Election Commission:- draw up voter list (real and imaginary friends included), fix dates of elections, ‘close-two-eyes’ and announce election results.